Eye-Tracking II—Are Onscreen Graphics Content Or Clutter??? Is the proliferation of on-screen graphic enhancement helping or hindering a viewer’s ability to understand new information? Another important study making use of eye-tracking technology sheds light on just how on-screen infographics and graphic enhancements may affect the way people process additional onscreen content. Sheree Josephson of Weber State University and Michael Holmes of Ball State University took 36 college students and exposed them to news programming they had not previously seen. In other words, new content. The new content was served up to test participants via three different types of screen presentations. One was just the traditional talking news head, another added textual graphics, then a third added both textual graphics—and an info crawler containing information not pertaining to the story on the main screen. Adding screen elements took attention away from the main screen—not from each other. The main screen is still the star—but when new elements are added, attention is taken away from the main screen only. In other words, the secondary elements didn’t take attention away from each other, only the main screen. Common eye pattern distributions indicate design of screen elements may be responsible for altering fixations across the screen. 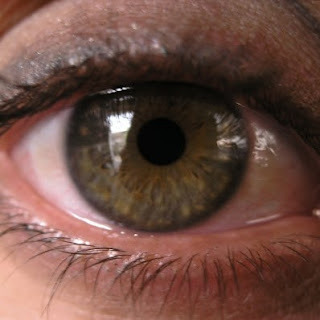 Because of similarities in the distribution of eye fixations, the researchers concluded that the design of new content may play a part in the distribution of eye fixations on the screen. Size, position, and brightness are common elements that draw attention to a design. The text crawler didn’t reduce recall of the main story. Introduction of the text crawler—which contained text not pertaining to the story being delivered by the on-screen news reporter—did not reduce recall of the main story. So, even though new and secondary information is available and presented at bottom of screen, the viewer’s recall of the main story did not see an appreciable decline. Text headlines summarizing story points increased recall—suggesting the power of redundancy. When text headlines were associated with a story—reinforcing the story’s main points—recall increased. This suggests the power of dual channel information processing (audio/video and text)—while it shows off the reinforcing power of redundancy to drive a message home. However, text headlines diminished recall of non-headline content—suggesting interference effect. While text headlines associated with a story increased recall of main points in text headlines—it also diminished the recall of non-headline content. Such a scenario called “interference effect.” That is, the delivery of the main points interfering with recall on information not supported by a textual headline. Knowing how the eye treats screen content is a key step in designing interfaces and prioritizing information for the maximum benefit. Learn how FYI puts our EPG expertise to work for your maximum benefit—and how we’re always tracking what’s important in entertainment communications. Just click below. ATTRIBUTION: Josephson, S., & Holmes, M.E. (2006). Clutter or content? How on-screen enhancements affect how TV viewers scan and what they learn. Proceedings ETRA 2006: ACM SIGGRAPH Eye Tracking Research and Applications Symposium (pp. 155-162). New York: ACM Press.